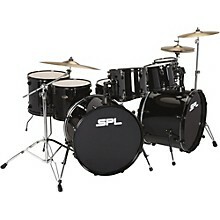 Double your bass drums, double your fun. 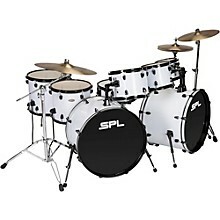 The SPL Unity 8-Piece Shell Pack is the double-bass monster of Unity Series drum kits, featuring two kick drums, three mounted toms, two floor toms and a snare — with enough power and tone to make yourself heard. This monster set features toneful and durable 5.6mm, 8-ply poplar shells, which provide a live, bright sound and superior projection — very similar to birch. The 45-degree bearing edges enhance attack and creates greater sustain, resulting in a driving, modern sound. Comes complete with traditional mounts and standard lugs. Plus, SPL’s one-piece, weld-less steel hoops further enhance strength throughout. Tom(s):	8 x 7, 10 x 8, 12 x 9 in. Floor Tom(s):	14 x 12, 16 x 14 in.